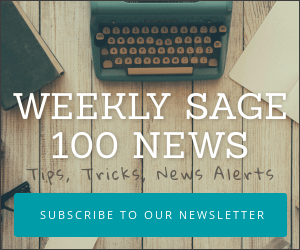 If you’ve been waiting for the tax table updates from Sage for your Sage 100 ERP (formerly MAS 90 or MAS 200) be advised you can now download these from the Sage portal (in keeping with prior years there are NO disks sent by mail). IRD (Interim Release Download): Interim Release Download contains the Year End program changes for Payroll, Accounts Payable and Electronic Reporting modules. It also contains necessary program changes for eFiling and Reporting. TTU (Tax Table Update): Tax Table Update contains changes to applicable Federal and State withholding tax tables and wage limits, State Disability percentages and/or limits and State unemployment limits. IMPORTANT: This is the last year that Sage will issue an IRD or W2 form changes. Next year in December 2014 you will use the Sage Aatrix for both form printing (1099 and W2) as well as electronic filing (The electronic filing module is replaced by Sage Aatrix). Closing the year for payroll within Sage 100 ERP is fairly straightforward provided you remember these important items. W-2s must be printed before performing Payroll Quarter and Year End Processing. If the W-2s cannot be printed before Quarter and Year End Processing is perform, copy the company data to a new (backup) company and print the W-2s from the copied company. Important Reminder: You must install the latest Interim Release Downloads (IRDs). For more answers to frequently asked year end questions regarding Sage 100 ERP see this PDF. 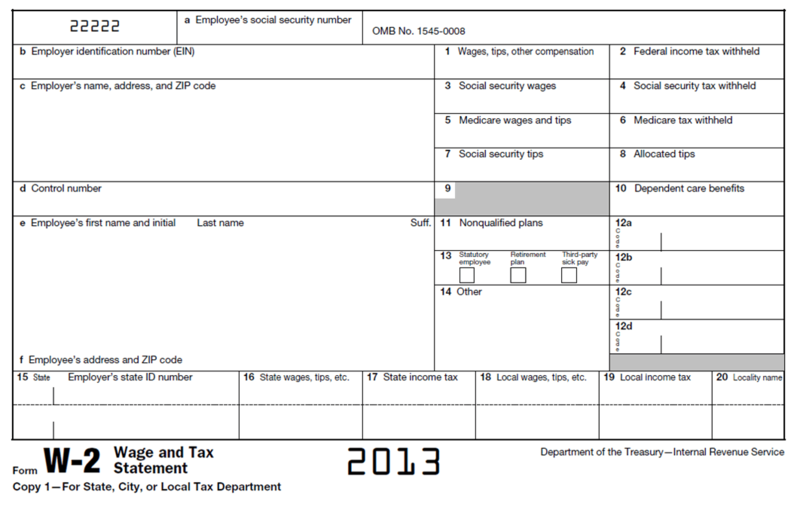 Sage have just released the updated IRS form 941 for 2013 filing. This update is available for users of Sage 100 ERP on v4.30.23 and higher. In order to install the update you’ll need to download the program patch from Sage’s customer or partner site. Why isn’t the form 941 aligning? In some cases customers have observed that the form is not aligning properly. The cause appears to be that the computer from which they are printing the form has the default system font set to something other than 100%. Please change your computers display (DPI) settings to Smaller – 100%(default). NOTE: This will require a reboot for changes to take affect. The Sage 100 ERP 941 form update for 2013 is now available for download. The employee totals verification report no longer prints a difference when an employee has additional medicare wages or tax. 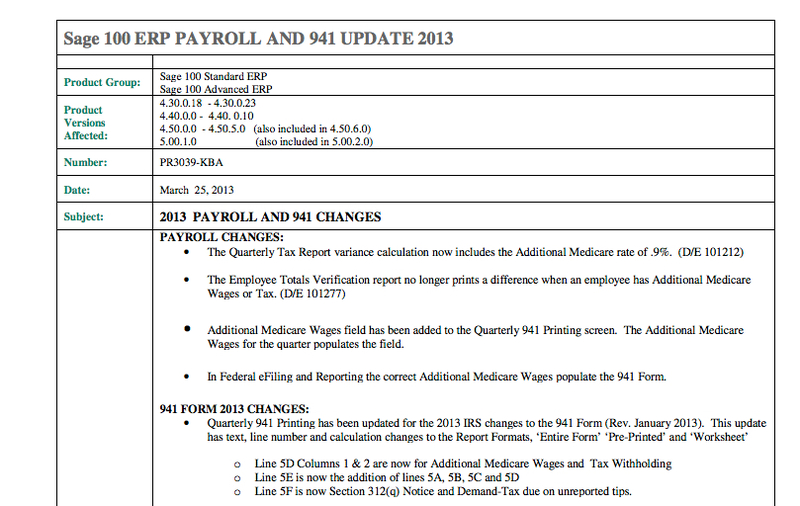 Additional medicare wages field has been added to the quarterly 941 printing screen. 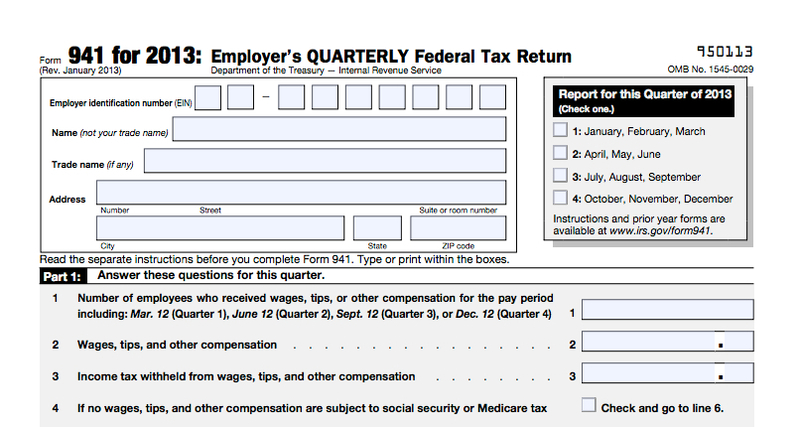 Quarterly 941 Printing has been updated for the 2013 IRS changes to the 941 Form (Rev. January 2013). This update has text, line number and calculation changes to the Report Formats, ‘Entire Form’ ‘Pre-Printed’ and ‘Worksheet’. Note: The pre-printed 941 form and pre-printed schedule B formats have been designed based on the downloaded 941.pdf and schedule B pdf from the IRS web site. If you use the pre-printed form formats the alignment may need to be adjusted or the form may need to be modified.